Ask an Expert: FAQ for Which Orange Juice Has the Most Vitamin C? FAQ for Which Orange Juice Has the Most Vitamin C? The following FAQ contains frequently asked questions and answers about the Which Orange Juice Has the Most Vitamin C project. If you are having trouble with the procedure, you may find assistance in the answers below. Q: Instead of the Lugol’s solution or the iodine solution for starch test, can I substitute a pure potassium iodine solution? A: When you first seen the color change, you should stop the buret from dripping, pick up the flask, swirl it, and put it back down. Wait for 30 seconds. If the color goes away, then continue with the titration, but if the color stays, then stop the titration. The color change indicates that all of the substance being titrated (vitamin C, or ascorbic acid) has reacted with the titrating substance (iodine titration solution). Specifically, when there is no ascorbic acid left, the iodine can react with the starch, causing the solution to change color. Therefore, the first time color lasts after adding a drop of iodine solution and swirling it is the first time when there is no more vitamin C in the solution, and this is when you should stop the titration. Be careful to ensure that the color is lasting and isn’t temporary by always swirling the solutions well. Using incorrect concentrations. 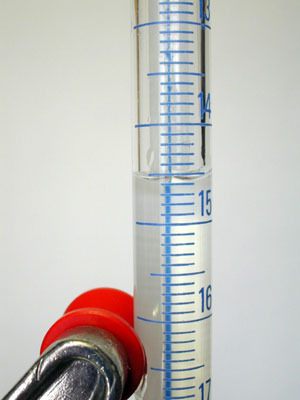 If your vitamin C standard solution is too concentrated or your iodine titration solution is too dilute, or your starch indicator solution is not between 0.5 to 1.0%, it may require much more than 50 mL of iodine solution to titrate the standard solution and/or orange juice. The most common problem here is an overly dilute iodine solution; sometimes, the Lugol's iodine solution sold in stores is already dilute, and you don't need to dilute it more. If you have other questions about the procedure or need assistance troubleshooting your project or the Experimental Procedure, please post your question in the forum for this kit at Ask an Expert: http://www.sciencebuddies.org/science-fair-projects/phpBB3/viewforum.php?f=64. Our team of volunteer Experts is available to assist. We attempt to reply to questions within 24 hours. Please note that you will need a free Ask an Expert account in order to post questions.